Now anyone can easily and conveniently give a unique online music or art experience to their loved ones this Holiday season - for about a dollar a day. ArtistWorks, the leading interactive lifestyle social learning platform, today announced the availability of both digital gift certificates and physical gift cards for their 24 online interactive Video Exchange™ music and art schools. Now anyone can easily and conveniently give a unique online music or art experience to their loved ones this Holiday season - for about a dollar a day. Whether it’s a Christmas gift, Hanukkah gift or a gift for yourself, these cards and digital certificates can be purchased ahead of time, or are perfect for that last minute gift. You can give them as a same day gift or a printable gift too! 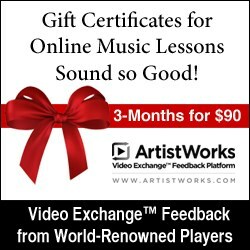 ArtistWorks’ online music lessons have long been known for their unique Video Exchange Feedback Platform, where an average music lover – beginner to advanced – can submit practice videos and receive video feedback from world-renowned teaching artists like Paul Gilbert, Nathan East, Mike Marshall, Tony Trischka, John Patitucci, Howard Levy, DJ Qbert and more. Currently, tens of thousands of members in nearly 100 countries have improved their playing with ArtistWorks’ unique learning communities. 1. Give a gift card or digital certificate to the lucky person in your life. 2. They can redeem the code on their Gift Card or from the digital certificate and receive three months of online lessons at the ArtistWorks instructor school of their choice. 3. Once enrolled, they begin with access to a comprehensive library of pre-recorded video lessons from beginner to advanced. They can view these lessons at their own pace, whenever they have time. 4. When they want guidance, they can submit practice videos to their world-renowned teacher through the ArtistWorks Video Exchange™ Feedback Platform using their webcam, phone, iPad or video camera. 5. Their all-star instructor will review the video submission and respond with video feedback designed to help the student get better – fast.